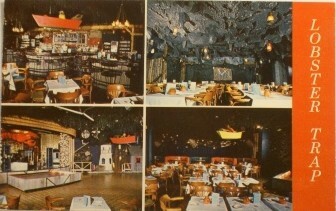 RobinMetcalfe writes: a postcard of the interior of the Lobster Trap, known as "The Fabulous Lobster Trap," a major venue for travelling professional drag acts in the early 1970s, located in the Trade Mart Building, with its entrance under the overpass. Note the nets and dories hanging from the ceiling. The mind boggles about seeing high drag in such an environment. I never saw a show there - the audiences were overwhelmingly, straight - but the performers used to show up later at the gay club.